We are a Financial Technology specialist building the next generation platform to make investments easier, smarter and safer. Financial institutions are empowered to go-to-market and scale their business quickly on our multi-asset, multi-market, integrated Platform for Risk and Investment ManagemEnt ( P R I M E ). Our customers include leading stock & derivatives brokers, crypto traders, assets management and private equity firms, banks and exchanges in Singapore, Malaysia and Hong Kong. For Brokers, P R I M E‍ ‍‍ is a front-to-back investment system that allows them to‍ ‍‍offer their customers a‍‍n integrated account to trade across products, gain a bird's eye view of their customer exposures, assert pre-emptive risk control and transform their cost & revenue models. For Fund & Private Equity Managers, P R I M E‍ ‍‍ is an integrated investment management system that simplifies portfolio consolidation, risk & performance analy‍sis and client reporting. It is also a RegTech solution for investment c‍‍ompliance monitoring, personal account dealing, regulatory declarations and reporting. For Banks, P R I M E‍ ‍‍ is an integrated secured lending system that supports sophisticated risk-based portfolio financing, structured and syndicated loans in addition to conventional term loans, revolving credit and mortgage loans. It is also a factoring & supply chain financing platform. For FinTechs, P R I M E‍ ‍‍ is your choice platform for P2P margin financing, factoring and pawnbroking. We advise our customers on areas such as Share Margin Financing, Securities Borrowing & Lending, Contracts for Differences, Equity Options, Collateral Management, Corporate Actions, Risk-based Capital reporting, etc., and provide end-to-end implementation and customisation services for our P R I M E suite of systems. We provide end-to-end Enterprise Data Warehouse implementation from consultancy, data analysis and modelling, data transformation and cleansing to downstream applications such as reporting, visual analytics, management dashboard and interfaces to other systems. Using our Rapid Enterprise Application Platform (REAP), we help customers implement enterprise-grade applications with data maintenance, data loading, online enquiry and user reporting features quickly (in weeks instead of months) complete with configurable review and authorization workflow and comprehensive audit trail. We have extensive system integration experience with financial systems such as SGX CAS, CDP, CBS, IRESS, GL, HiPort, HiPerformance, Portia, Factset, Barra, RiskMetrics, etc. We are also experts in market data application programming interfaces and have performed numerous automation projects using Bloomberg, Reuters & ICE. Optimai provides customer support services in office hours online and over the phone to all customers, including assistance in planning, installation, training, troubleshooting, maintenance and upgrading. REAP transforms resource intensive and time consuming activities of software programming and testing into highly productive configuration tasks whereby new application modules can be setup very quickly in hours instead of days by junior developers. 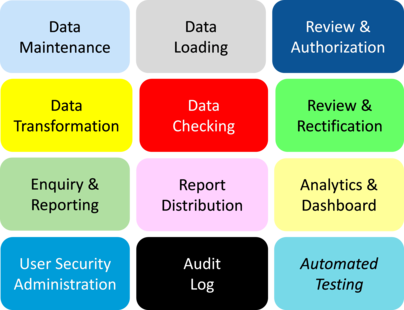 REAP modules support enterprise features such as data maintenance, maker-checker control, centralized review and authorization, comprehensive audit trail, data loading, transformation and checking, enquiry, reporting and analysis and automated testing. Abstracting common design and usage patterns of business applications and implement them as configurable components. This drastically improves productivity. Separating business logic and processing rules from front end application elements and centralizing them at the server. This drastically enhances understandability and maintainability. Implementing a centralized application metadata repository. This drastically enhances ease of making changes that are applied application wide. Together all the above significantly enhance software quality and also enable us to embed automated software testing features in our systems. With REAP, we are able to adopt an extremely rapid prototyping approach towards business application development and to deliver systems that can be customized to different customers’ requirements and yet are robust and maintainable. Over the years, we have successfully implemented enterprise systems ranging from back office to regulatory reporting to enterprise data warehouse systems. Through working closely with our customers and taking a keen interest in their domain, we have developed strong industry knowledge and gained an in-depth understanding of their business and technical requirements. Optimai started off by building turnkey financial systems for financial institutions. Through working closely with our customers, we developed strong domain knowledge and gained in-depth understanding of our customers’ business and technical requirements. Over the years, we have successfully implemented enterprise systems ranging from back office to regulatory reporting to enterprise data warehouse systems. Through a combination of keen understanding of our customers’ business, a devotion to deliver quality systems and commitment to responsive customer service and support, Optimai has turned many customers into friends and supporters who are willing to act as references and refer new business. Today, our customers include leading stock & derivatives brokers, crypto traders, assets management and private equity firms, banks and exchanges in Singapore, Malaysia and Hong Kong. Rapid shifts in technology, coupled with higher regulation, capital costs and changing customer behaviors, are shaking up the global financial industry. Financial institutions that are burdened by legacy technologies and slow in embracing innovations risk being disrupted by new competitors touting slick user experiences and new business models powered by technology.